In preparation for the March for Science on Earth Day, April 22nd, Senator Martin Heinrich penned an essay touting his support of science and research in New Mexico. 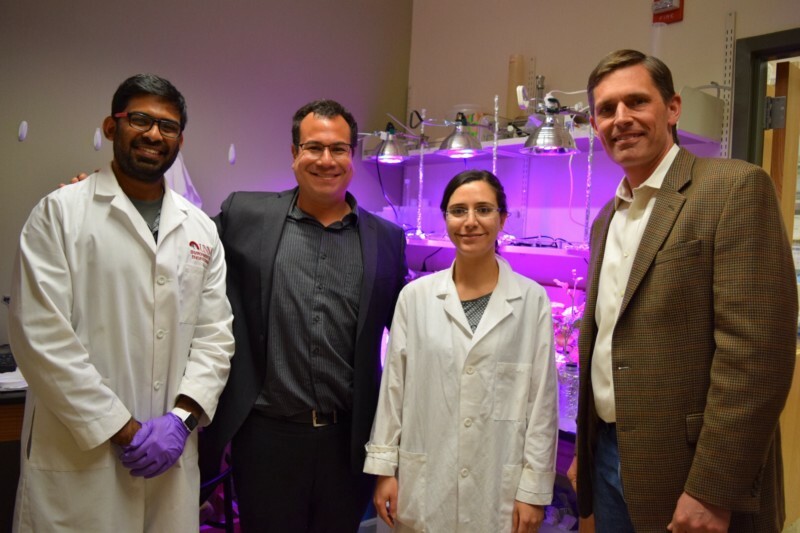 Earlier in the week, Senator Heinrich visited the University of New Mexico to visit with the Vice President for Research Gabriel Lopez as well as students and faculty to discuss the importance of federally funded research in STEM areas. Part of the meeting included a tour of labs across campus, including the environmental engineering lab where he met NM EPSCoR team lead José Cerrato, EPSCoR PhD student Sumant Avasarala, and EPSCoR post-doc Elaine El Hayek and took the awesome picture below. In his essay, Senator Heinrich discusses his own background in engineering and the importance of using science "as a guiding light" for policymaking in Washington, D.C.
"Our capacity to seize opportunities and deal with the many challenges we face in the decades ahead," he writes, "rests heavily on our ability to make decisions driven by scientific data. This week, I met with students and faculty at the University of New Mexico to learn about important research funded by the National Science Foundation and tour an environmental engineering lab on campus. In just one afternoon, I heard about critical research of long-term ecology in the Middle Rio Grande Valley, cutting-edge technological solutions for water and environmental challenges, and materials research with exciting computing, solar, and quantum energy applications." You can read his essay in full on Medium, and stay up-to-date with what's happening in the Senate on his website, https://www.heinrich.senate.gov/.